I see in your example you have the check signal only for UDP channels. If Check signal only for UDP channels is selected program will test signal only for UDP streams. Otherwise UDP and HTTP streams will be examined. You can also pick Scan selected channels popup menu item to check all selected channels no matter of this check box state. RTMP protocol support will be added in the next update soon. I would this is why I sent this! I am really testing your software intensely where do you want me to send to you my suggestions and findings? Ok. Thanks. You can send it to email or forum thread. See Links page. I just discovered this program to use it as an easy way to edit my xbmc playlists and epg . it does a great job indeed .I have a small problem with epg . the exported file dosent show greek characters . what can i do to have a proper epg file ? Good morning. I am using Portugueses m3u link for channels and for epg I am using the link you have on help. Altough only a few channels Ate showing the epg. What can it be? 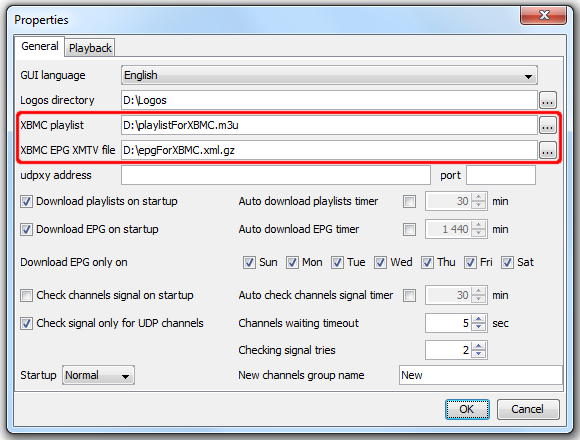 You should use “EPG assign mode” to link playlist channels to EPG channels. And now, since they’ve taken it down? Suggestions? Thanks! When in “EPG assign mode” you need to select channel without EPG (red name), then select EPG channel in EPG list, then confirm matching by “Ok/Enter” key press. I am using atlanta smart box g4. I am using a perfect player for 2 months. It gives me 1 week error and closes itself. Is it a problem caused by me or is it from the program? Try to clear app’s data/cache or reinstall the app. Also, try different playlist and decoder. Hi Nikman, Thanks for your response. There is no any playlist to export for the epg apart from the tutorial video.